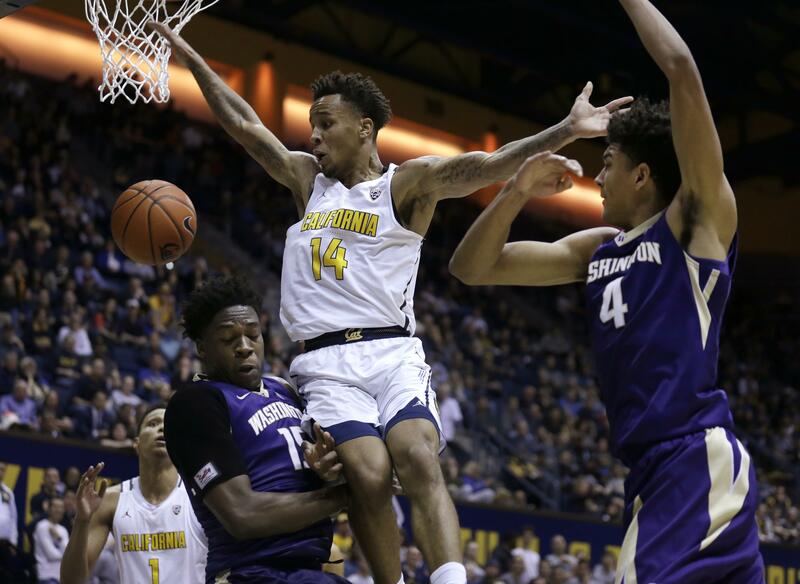 BERKELEY, Calif. – Ivan Rabb scored 20 points with 14 rebounds and Jabari Bird added 16 points to lead California to a 69-59 win over Washington on Thursday night. The Huskies erased a 10-point Cal lead with a quick 10-point surge early in the second half and the game was tight until the Huskies went cold in the last 4 1/2 minutes. A layup by David Crisp at 4:35 pulled Washington within 59-57 but the Huskies didn’t score again until a layup by Noah Dickerson with 1:48 to play. That was the only UW basket in the final seven attempts. Stephen Domingo made two free throws for the Bears and Rabb had a follow up layup and hit a jumper to make it 65-57 with 2:22 to play. After Dickerson’s bucket, Charlie Moore and Rabb each made a pair of free throws in the final minute to seal it. The Golden Bears (12-5, 3-2 Pac 12) made 11 of 15 free throws in the second half. Crisp led the Huskies (8-8, 1-3) with 16 points and Dickerson had 13 points and nine rebounds. Washington: With three conference losses already, coach Lorenzo Romar’s team is on the verge of being an afterthought in the Pac-12 title chase. … Romar remains three wins shy of 300 with the Huskies. … Leading scorer Markelle Fultz was held 10 points below his average and was limited to 12 on 3 of 15 shooting. It’s only the second time this year that Fultz has been held below 13. … Dickerson’s rebounds matched his high over the past four games. California: The Bears continue to have problems putting teams away when they have a lead but still rode the momentum from their win over USC into a critical conference win at home that keeps them in the thick of things. … Rabb has eight double-doubles in the 15 games he’s played in this season and continues to show benefits from putting off the NBA for a year. His game is much more well-rounded and he’s stronger on the boards. … California shot just 35.9 percent in the first half and 39.1 for the game. Published: Jan. 12, 2017, 9:40 p.m.